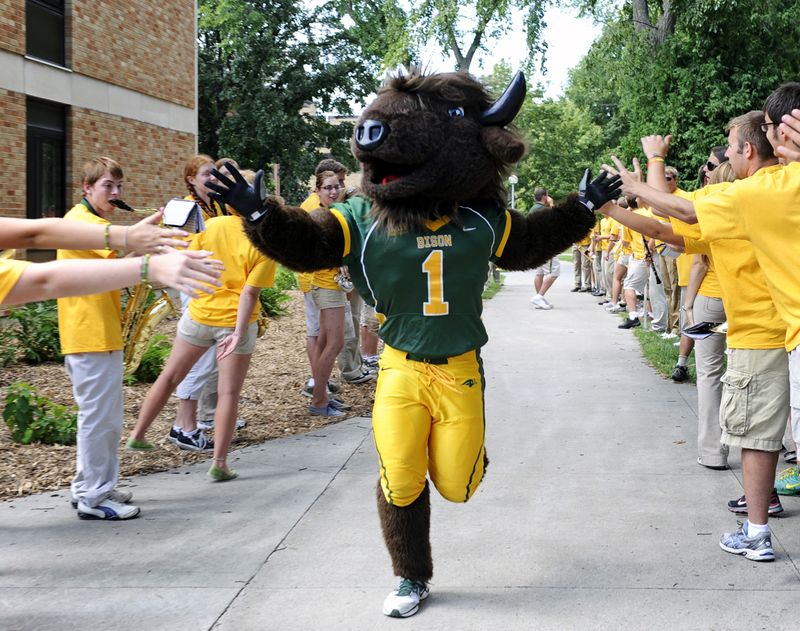 SIOUX FALLS, SD – Thundar, the North Dakota State University bison mascot, has had a busy year. First, the Bison complete a perfect 15-0 football season capped off by its third straight NCAA FCS national championship game title in Frisco, Texas in January. The championship football run started in August in Manhattan, Kansas with a win over defending Big XII champions Kansas State. The Bison got the bid on the Summit League championship tournament game victory over the upstart Fort Wayne Mastodons 60-57, in a thrilling, come from behind fashion, for the top seeded and regular season champion Bison of coach Saul Phillips. A three point goal by Fort Wayne’s Michael Kibiloski with 1:42 remaining in the first half forged the largest lead by either team in the game at 35-27. A Bison three pointer closed the deficit to 35-30 at the half. The Mastodons held the Summit League player of the year Taylor Braun to three first half points with a physical, tough defensive mentality. Steve Forbes scored a layup to start the second half to put the Dons up 37-30, which would be the largest lead either team would enjoy in the second half. The score was tied seven times and there were thirteen lead changes in the tightly contested game. The game came down to the end and the beginning of end started with the last media timeout of the game with 3:37 left, with Fort Wayne holding a precarious two point lead at 51-49. Braun, who had been held to five points, reeled of ten straight Bison points including a 24′ three point goal and an old fashioned three point play off a dribble drive and a foul by the Don’s Forbes with 12 seconds left to put the Bison up 59-55. Joe Reed hit a jumper with 3 seconds left to pull the Don’s to within two, but Kory Brown was fouled on the inbounds pass and hit one free throw to put the Bison up 60-57. Brown missed the second free throw and Fort Wayne managed a desperation half court shot at the buzzer that was off the mark. TrayVonn Wright paced the Bison with 19 points. Braun, Who was selected as the tournament MVP, tallied 15 and Marshall Bjorklund chipped in with 12. Fort Wayne failed to have a double digit scorer but Luis Jacobo, Pierre Bland and Kibiloski each had 9 while Steve Forbes and Isaiah McCray each contributed 8 points. Both teams shot 40% from the field. Fort Wayne out rebounded the Bison 37-29 but committed 10 turnovers compared to only 4 for the Bison. The Bison, who won the Summit League championship in 2009, will find out their NCAA pairing on Sunday at 6:00pm. Fort Wayne accepted a CIT tournament bid immediately after the game. Fort Wayne now stands at 24-10 while the Bison improve to 25-6. This was the first Summit League tournament since 1994 that has had its seeds hold all the way through. The Summit League tournament attracted 37,304 fans, which ranks as the third best all time attendance figure. The Summit League tournament moves next door to the Denny Sanford Premier Arena next season, which opens this fall and will seat 12,000.